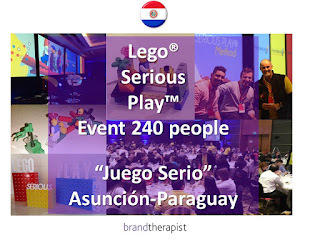 brandtherapist: lego© serious play™: "hard fun in paraguay"
lego© serious play™: "hard fun in paraguay"
Invited by Juego Serio as certificated LSP facilitator to be part of the team that drive a 240 people event in Asuncion del Paraguay. we made them play, and let them discovered by themselves strong insights about teamwork using the powerful methodology of Lego© Serious Play™. I got the best shipping service by www.a1autotransport.com/ship-car-to-paraguay.php for my car in the most affordable rates! I would like everyone to contact them because their service is out of this world!